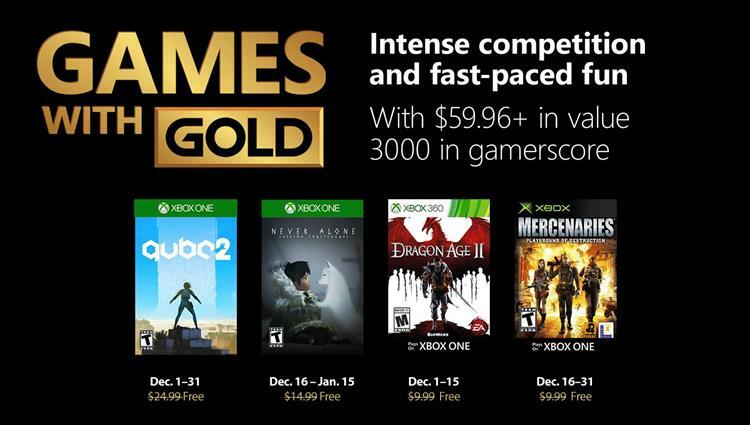 With December right around the corner, I was wondering when Microsoft would get around to announcing the months Games With Gold Freebies. Well, today Major Nelson put up on his blog the four titles that will be available, which includes two Xbox One, one Xbox 360 and an original Xbox title. Available from Dec 1st to Dec 31st will be Q.U.B.E., with Xbox 360 title Dragon Age II available Dec 1st -15th, Never Alone Dec 15th - Jan 15th and finally, Xbox original Mercenaries: Playground of Destruction Dec 16th - Dec 31st. Enjoy the freebies and lets see what the new year brings.